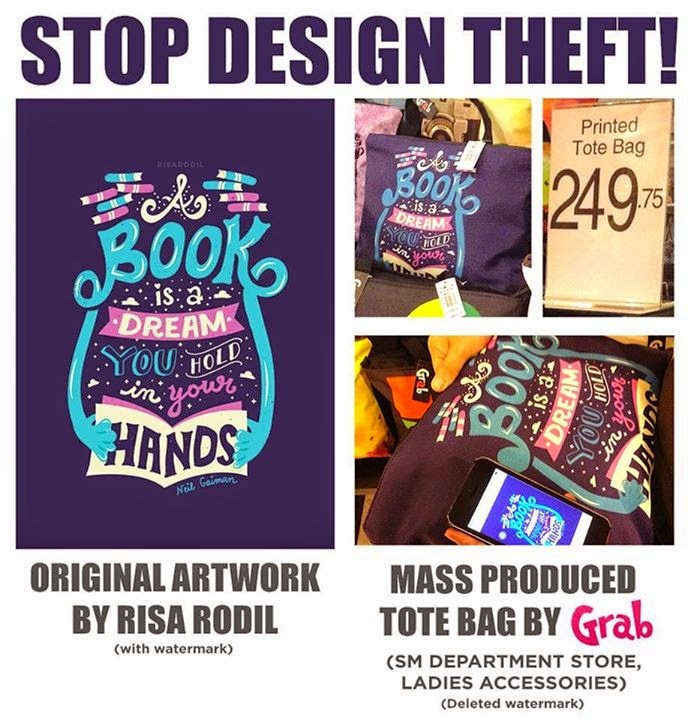 An SM Department Store is getting a lot of flak online when a shopper found out that a bag being sold in the store has a design very similar to the work of a 21-year old designer/illustrator named Risa Rodil. The design was allegedly used without permission from the artist. In other words, the design was stolen. Shopper Ralph Cifra brought attention to the alleged design theft by posting a photo of Ms. Rodil's design alongside the bag on Facebook. As of this writing, the post has been shared over a thousand times. The bag in question is a "Grab" brand. It's still unknown if Grab is an SM brand or an outside brand. The original artwork by Ms. Rodil features a quote ("A book is a dream you hold in your hands.") by the well-known author Neil Gaiman done in lettering art. The original artwork also contained a watermark by the artist. In the design that was imprinted into the bag being sold by SM, the watermark by the artist has been removed. Ms. Rodil left a comment on the post saying "We're trying to put the word out there so we can educate more people about this. As artists, we wouldn't want to compromise the quality of our work just because "Internet is Internet". So if there's something we can do to at least educate a small chunk of the Internet, why not. The point of this post is not to cry over spilled milk, but to raise awareness. Para hindi na lang lagi artists ang kelangan mag-adjust." Ms. Rodil also stated that they had already talked to the SM Store manager and they were given instructions on where they can file a complaint report. A netizen also commented that this isn't the only design stolen by Grab. According to him, many of the designs of Grab bags were used without permission from their original creators. He however didn't elaborate nor provide additional details about these other designs that were allegedly stolen by Grab.